I had the opportunity to watch the Villanova Women’s practice for an hour. I can remember watching a Merrimack practice the year before in which they ran a series of five-out sets. After practice, their coach Monique LeBlanc informed me that they took the offense from Villanova. Villanova Assistant Coach Laura Kurz was kind enough to give me the basics for their cues during their practice. I was reminded of two things as Head Coach Harry Perretta interacted with the ten or so guests at the practice. First, Villanova does not have a secondary fast break. They like to just go right into an offense. Second, at times they will not call anything. He felt it was important to let the players play in a motion offense and give them the opportunity to be creative and not feel restricted. On this day, I saw a little more robotic version of do exactly what the numbered cut says, but there were some interesting spontaneous moves by the players as well. For more on the system, there are a series of videos on YouTube from Hoops Kings and a short clip from Championship Productions of Harry Perretta explaining. The best part of their practice for me came after their dynamic stretch as the three assistant coaches went into skills work with groups of four to five players. Coach Perretta told us that they have made a decision to incorporate more skills work into their practices than they have done in the past. I did not want to interrupt his focus from the practice to ask why, but I certainly respect it. I was reminded of a conversation I had with current Boston University Coach and former UConn Assistant Marisa Moseley about skill work. If these high profile D1 schools are preaching more skill work, why are we not doing this in practice? I was writing down what I saw as the skills work progressed furiously. As a result, I missed some of the things that I saw, but no hoop was working on exactly the same skill. Here are just some of the basic concepts. There were other sequences that I did not get down on paper. What got me most excited thinking about this skill work and how I can incorporate it is that they avoided mass repetition. They would do a curl for a lay-up then a curl for a pull up. As the research of Peter C. Brown indicates in Make It Stick, mixing up the type of practice you use (interleaving) is more effective than practicing the same shot again and again in the long term. Villanova did have team managers present for this portion of practice, so I’m not sure if they kept track of stats. From what I could tell though, the players did not track their makes. That is probably one thing I would do to put pressure on them and make the drills more competitive. One other takeaway from this series of skill work is the Villanova coaches drilled game shots at an up-tempo pace. I watched Coach Kurz give direction on the type of moves she wanted to see from players. For instance, at one point she wanted a second dribble to be a hesitation. Her directions were quick and she did not even ask a player for a ball to show it. If you are going to teach many types of shots in a short spurt of time such as this, the methods of instruction need to be brief. This will help hold players more accountable to the terminology in your playbook. It also ensures that way players get the heart rate up and the team maximizes the reps.
Villanova worked their offensive system against live competition following the skill work. They began with about two to three minutes three on three and then roughly eight minutes of four on four. All of it was in half-court. Logistically, it was structured so that offense went to defense and defense went to a line at half-court. Players only had about 20 seconds to score within the framework of the offense. They started off with working on 1 (basket cuts) and eventually went through all eight options within the framework of their five-out offense. The point guard initiated the offense most of the time, but not all the time. Given the equal opportunity style of a five-out offense players are more or less positionless. The structure denied the players any ability to play in transition. I liked the idea of this because teams at the high school level seem to score most of their points in transition. To win close games or win games late in the season when transition defenses are stronger requires a disciplined half-court attack. That being said, once a shot went up, the structure did not incentivize players to play transition defense. I would want to add an element where a player or two (depending on your philosophy) is getting back when the shot goes up. After the four on four worked through each element in their offense, they went to five on five. The drill they used had five players on the baseline and five on the foul line extended. 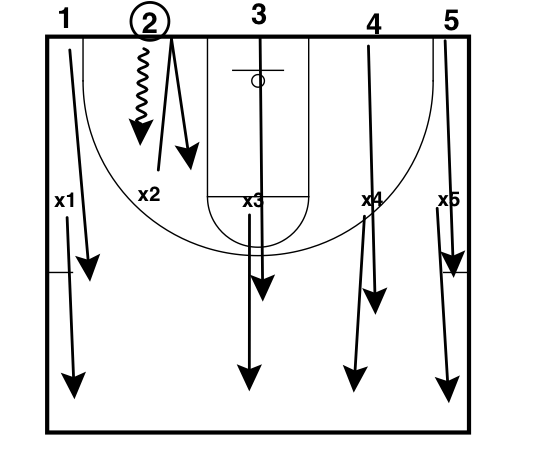 The coach threw the ball to one of the players on the baseline and that team attacked the far goal while one defender had to touch the baseline. Many teams run some variation of this drill (I call it penalty box because the situation is analogous to a hockey player coming out of the box). The drill is simple enough, but I came away with a new appreciation of what to emphasize. Villanova’s execution offensively in this instance was much different than my own team’s. They took any shot that was wide open. Sometimes the defense scrambled well enough to stop an open shot. In which case, they went into their five on five half-court offense. Every coach wants an open shot in five on four situations, but that’s not being realistic. That philosophy forces players to chuck up contested shots and rush passes that close up. At one point Coach Perretta told the people watching on the sidelines that they do not have a secondary break. I did not ask why, but it probably goes back to a trust in their half-court system.